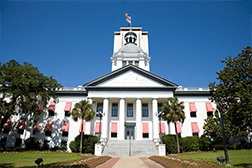 Florida Farm Bureau has announced its recognition of a select group of legislative leaders who played a critical role in helping to support the success of Florida agriculture during the 2016 legislative session. These legislators helped sponsor, co-sponsor and pass important legislation that positively impacts our state’s farm families and agricultural producers, improving the way of life for Florida’s farmers and ranchers and ensuring that agriculture continues to be a leading pillar of our state’s economy. Senator Travis Hutson and Representatives Matt Caldwell and Halsey Beshears are the organization’s 2016 Legislators of the Year. These three lawmakers demonstrated outstanding leadership in spearheading important pieces of Florida Farm Bureau’s legislative agenda. Sen. Travis Hutson was a great advocate on agricultural issues during the 2016 legislative session, sponsoring and helping to pass several bills on Florida Farm Bureau’s legislative agenda, including the general agriculture legislative package which reduced regulations and lowered taxes on farmers and ranchers. Sen. Hutson also sponsored a “Farm Vehicles” bill – legislation that streamlines and modernizes transportation laws to make it easier for farmers to transport their produce from farm to market. Rep. Matt Caldwell has been a leader in the Florida House for several years, taking on tough issues and helping to pass good, sound policy that benefits Florida agriculture during his time in Tallahassee. For the last two years, Rep. Caldwell sponsored the House’s water policy package, establishing a statewide, comprehensive and long-term water policy plan for Florida while providing an adequate water supply for agricultural use. After leading this issue for more than two years, this legislation overwhelmingly passed the Legislature and was signed into law early into the 2016 legislative session. Rep. Caldwell also sponsored a state lands bill that, among other good provisions, also creates opportunities for farmers to exchange agricultural lands for state-owned lands that can be used for low-impact agriculture. With a background in the nursery business, Rep. Halsey Beshears has been a long-term advocate for family farms with hands-on experience with production agriculture. During his time in the Florida House, Rep. Beshears has continued to be a staunch and vocal advocate on agricultural issues and a supporter of Florida Farm Bureau’s legislative agenda. During the 2016 legislative session, Rep. Beshears sponsored one of Florida Farm Bureau’s top legislative priorities, a transportation bill that defines “covered farm vehicles” and exempts farmers from statewide commercial license requirements in an effort to reduce the regulatory burden of transporting farm produce from the fields to the marketplace. Florida Farm Bureau also honors 20 Champions for Agriculture – lawmakers who do the things necessary to support and promote legislation that positively impacts agriculture. This year, Farm Bureau named seven Senators and 13 Representatives as Champions for Agriculture. “Florida Farm Bureau appreciates the commitment of our state lawmakers to Florida’s agricultural producers and we sincerely thank them for their role in making the 2016 legislative session one of the best in recent memory for our hard working farmers and ranchers,” said John Hoblick, President of Florida Farm Bureau. Sen. Hutson and Reps. Caldwell and Beshears will receive their honors at Florida Farm Bureau’s 2016 Annual Meeting in Orlando in October.